Organizing an authentic hickory set is fun but time consuming. 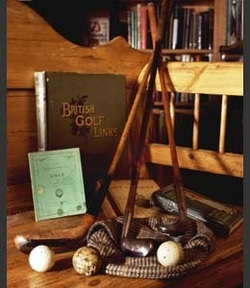 You can go to ebay and search hickory shaft golf clubs. There will be lots of clubs for sale. Look for descriptions saying playable condition. Even then you may have to take the heads off and glue them back in and weight them to your liking. There are many early club makers. Most hickory players like Tom Stewart irons. The most difficult clubs to find are good playable woods. Ben Sayers, Robert Forgan, McGregor, Wilson and Spalding are some names to look for.